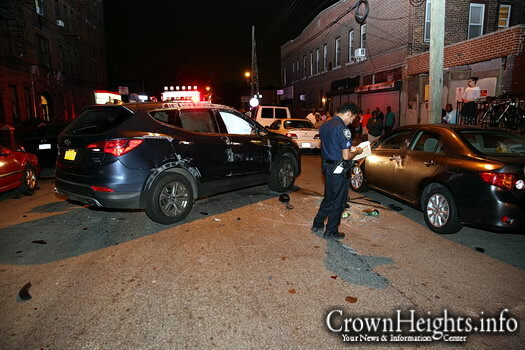 The driver of a speeding SUV fled the scene of a Midwood Street accident in Brooklyn, after the force of the car crash flipped a double parked vehicle onto its side. The crash occurred on Midwood Street just off Kingston Avenue at around 10:00pm. The force of the impact prompted multiple residents to call 911 and report shots fired. A gray Ford Explorer was traveling down Midwood when it collided with a double parked Hyundai SantaFe, flipping it onto its side while the SUV crashed into other parked cars. The driver then jumped out of his wrecked vehicle and fled the scene. One resident told CrownHeights.info that a resident had just finished unloading groceries from the Hyundai. A number of patients were treated by EMS at the scene and NYPD is still investigating whether the SUV was stolen.